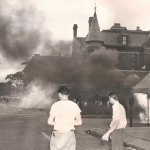 A lesser known pocket of this historic memory were a wave of race riots started by white supremacists during a hot World War II summer. Their rage at incoming black factory workers exploded in 1943. By the 1920s, Detroit was already infested with organized hate groups like the KKK and the Black Legion. Decades later during the second World War, the city was still predominantly white when hundreds of thousands of Southern workers settled north to help the war effort – despite a lack of available homes. Detroit boasted it could “bury Hitler“, but couldn’t even house its own workers. To accommodate the influx, the city built a housing project named after abolitionist and civil rights pioneer Sojourner Truth. 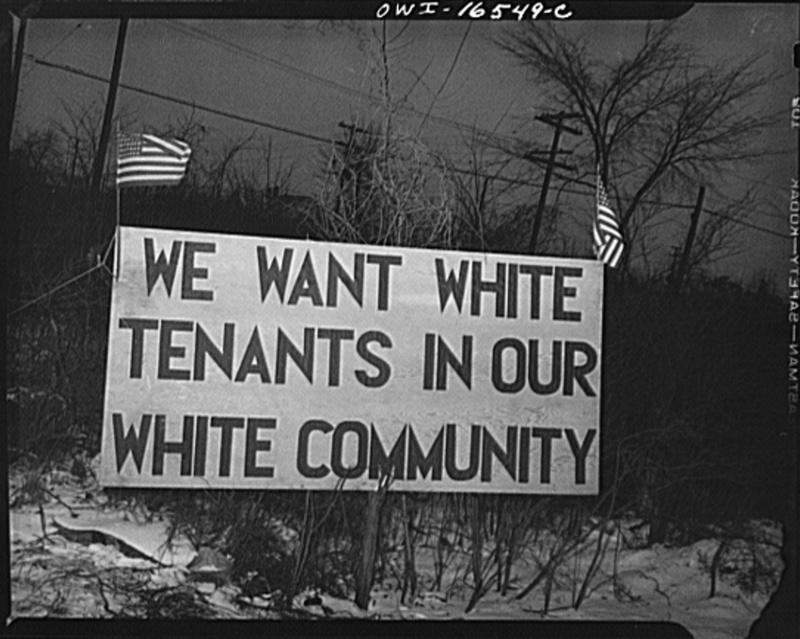 Many whites opposed both the name and the purpose of the project, attempting to block black families from moving in on several violent occasions. Federal housing authorities eventually rallied the National Guard to move-in and protect black residents at Sojourner Truth. Sign in respnose to Sojourner Truth housing project: Wikipedia commons. White supremacists escalated tactics of blockading people of color from their homes. Burning crosses were employed along with armed picket lines. Just weeks before the 1943 riots, the Packard Company promoted and integrated three black men to work on the assembly line. Despite being during a time of war, a staggering 25,000 white workers walked off the job in protest. Then, on June 20, 1943 a white sailor on Belle Isle claimed a black man insulted his girlfriend, inciting a brawl that spread to the city, and then grew some more. Unrest spread throughout the night and into the early morning amid false rumors of even worse violence. White mobs attacked black bars as patrons left to go home, pulling them out of vehicles. 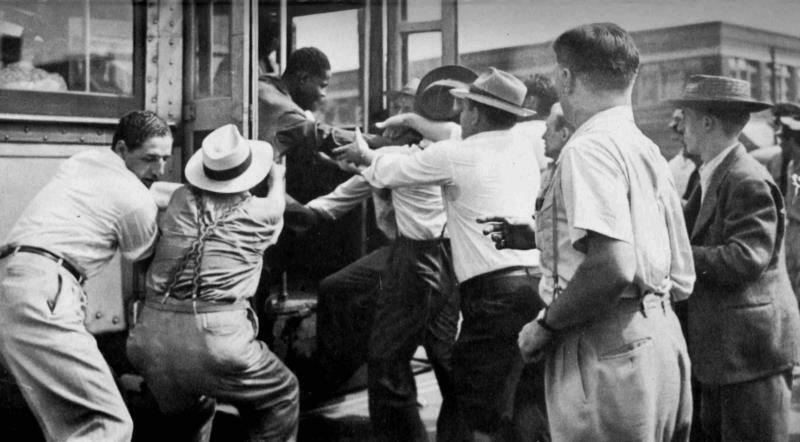 A mob drags a man from a Detroit streetcar during the riot. 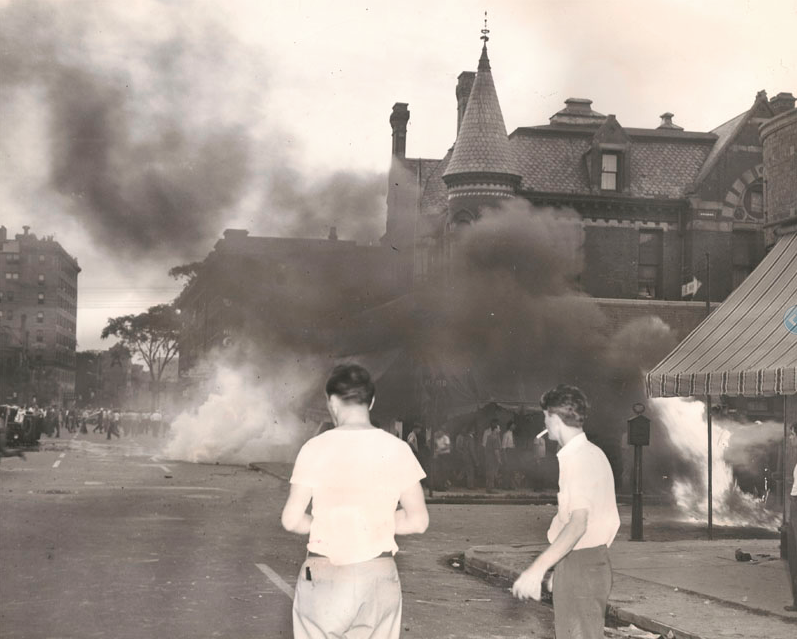 Black owned businesses were lit afire, focused especially in the Paradise Valley district, one of Detroit’s oldest. Further north just off of Woodward, cars were overturned and incinerated by white men. One such location was outside Ransom Gillis. It’s unclear when exactly the below photo surfaced. Apparently there’s been debate as to whether Ransom Gillis actually suffered damage during the 1943 riots. 63Alfred.com seems confident the surrounding smoke and fire must have caused damage of some kind, as white mobs lit cars ablaze and were dispersed by National Guard tear gas, both visible above. Below is an almost 180° reverse image of the intersection, taken just moments earlier, along with a current Google street view angle for comparison. In the first image, Ransom Gillis is just out of frame to the left, with an adjacent awning protruding into the shot. The striped awning at right in the image above occupies the center of frame below. The same intersection, 72 years later. 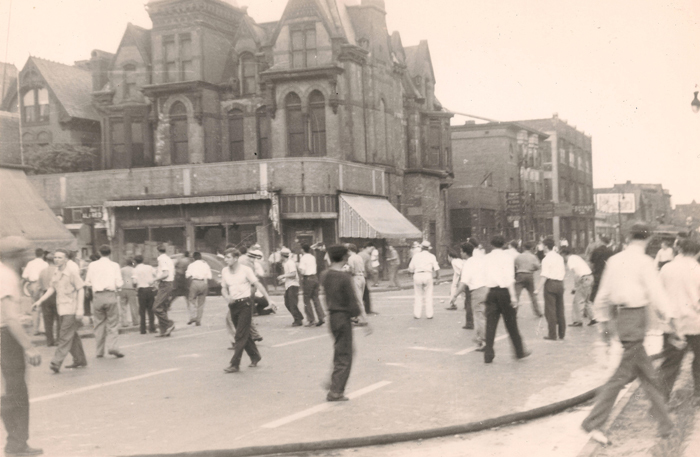 By many accounts, this area of Brush Park was already an overcrowded slum by WWII, where demand for jobs and housing exacerbated racial hostilities. Scapegoating of ethnic minorities for economic disparity has hardly changed today. Nationally, current events have seen white supremacist mob behavior to still be common. 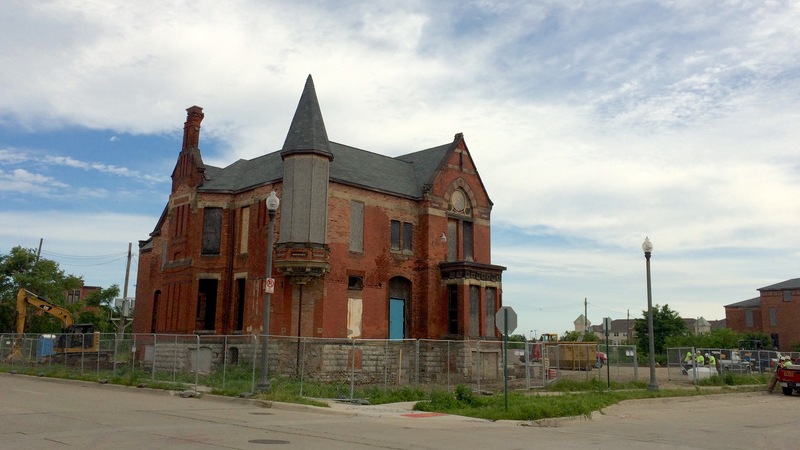 What also hasn’t changed, especially in Detroit, are the hurdles between many communities of color and secure housing and employment stability. It’s estimated for black families – who comprise 82% of Detroit’s population – the true unemployment rate is over 40%. Meanwhile, the mortgage and tax foreclosure crisis has not ended, and continues to drive blight and population loss. In 1943 a war economy dominated by white workers sought to include black people only at the margins. Today, a real estate economy seems to be moving in the same direction, with wealthier white entrepreneurs re-populating the city as rents begin to rise. As refurbishment and development ramps up, exactly how neighborhoods around Ransom Gillis are shaped remains to be seen. With luck, knowledge of historic memory will inform better policies tomorrow.